Place a cross in the top of your tomatoes and then place then in a pan of boiling water for a couple of minutes. Once the tomato skins are starting to peel, lift them out and carefully remove the skin and discard. Now chop the tomatoes. While this is going on gently sauté the onions and carrot on a large pan until softened. Now you can add your softened tomatoes and continue to sauté for a couple of more minutes. While the above are gently simmering place the halved peppers directly on to an open flame on your hob or use a kitchen blow torch. You want to completely blacken the outside of the peppers. Once blackened add them to your pan (inc all the black bits!) along with the water and stock cube and simmer away for 30 minutes or until the carrot pieces are tender. Finally put the mixture in to a blender and whizz until smooth, Then return to your pan and test for seasoning...add salt & pepper as required. 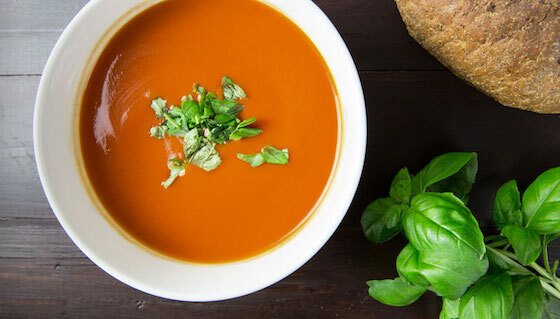 You may need to add a little water to thin your soup.